Continuing our draft breakdown, here is the 3rd round. Quick reminder: To count as a starter, a player must have either started for 5 seasons or, if they haven’t been in the league that long, started for at least half of their career. Not a bulletproof method (doesn’t account for the quality of the starters), but good enough to be informative. Also, I’ve added rows for FBs and Punters, since there were a few of them drafted in this round. Players and stats are from Pro-football-reference.com. 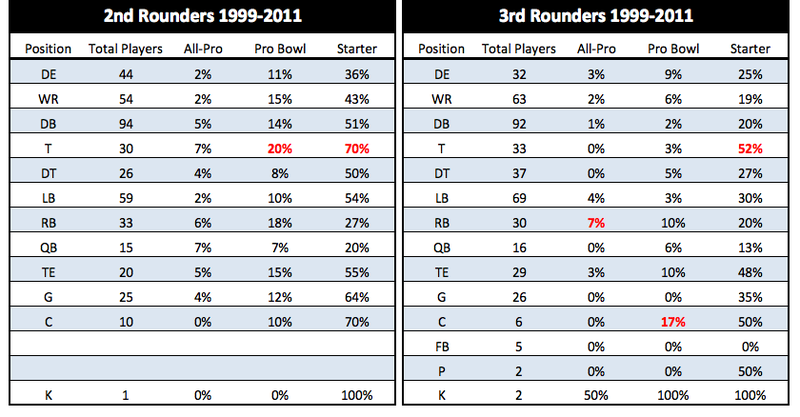 – Notice that Tackles and Centers are still at or above 50% starters, compared to 70% for T/Cs taken in the 2nd round. – The biggest decline was among DBs, with 20% of 3rd rounders starting compared to 51% for those drafted in the 2nd round. – There was very little difference between 2nd round TEs (5/15/55) and 3rd round TEs (3/10/48). – Less than 1 in 5 WRs taken ended up a starter. Just a few more round to go, then I’ll try to put a graph together that lets us look at everything at once and identify the optimal rounds for each position.